Two-piece suit dress with detachable collar and cuffs. Top is fashioned with small collar and peplum. Slim skirt is cut in four sections. 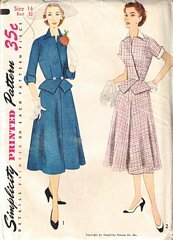 Short or three quarter length sleeves. Complete and uncut with pieces in original factory folds.